Well, this was supposed to go up earlier, but I got kind of distracted having baby. Oops! 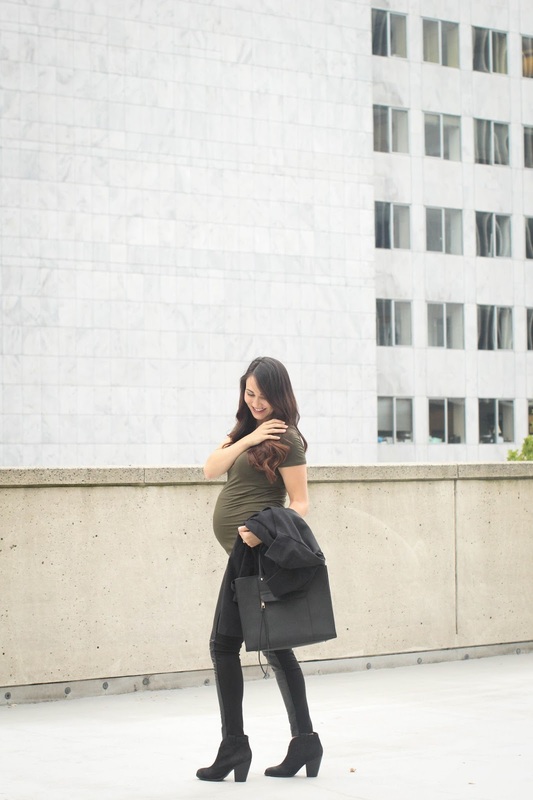 This was one of my favorite outfits from my pregnancy! We didn't get much cold weather except for a short trip to Seattle I took with Eric. I took every advantage of the cool temps and threw on one of my favorite coats from Hatch, which I'll totally be wearing now post-baby too! I'm also ridiculously obsessed with these booties. I love booties during every season, as they're the perfect mom-alternative to heels, but I'm definitely excited to whip out the knee-high/over-the-knee boots for fall! I've linked some similar non-maternity pieces below. Do you love booties, or over-the-knee boots more in fall?